The Sumter Gap connects form the Withlacoochee State Trail to the west and General James A. Van Fleet State Trail to the east. The purpose of this project is to close the 20-mile gap, it will provide alternative transportation, create economic opportunities. With the development of this system and by connecting the trails to pedestrian friendly downtown zones, it will make walking and bicycling more convenient, safe and enjoyable for people of all walks of life. The trail is projected to be a safe, inviting, and pleasant. The bike trail will attract tourists to Florida; the appeal is to make the trail family friendly to interest them to come and visit Florida. The bike trail is accessible to all and is not limited to a specific target audience. Families who come and visit will be able to get out and experience new surroundings. The bike trail will contribute to the beautification of Florida and will generate tourism and opportunities for locals. The Sumter Gap Trail is one of the largest missing segments in the Coast to Coast Connector Trail, it spans from Central Florida and will reach near the Atlantic Ocean. The need for this trail is that it will provide long distances of travel for recreational users by connecting major trail systems. This trail will provide a connection to neighboring communities. This trail will create future growth which will be easily accessed by pedestrians and cyclists and will minimize environmental impacts on the earth. In order for the coast to coast connector through Sumter and Hernando County to be successful, we plan on communicating and staying in touch with citizens who are interested in helping this connection for the biking community. We plan on handing out flyers at biking events and really keeping the biking community up to date on this connection. We’re going to get the word out the best that we can, but we’re going to need help from the biking community as well. Exposure is what will really get this connection up and running. Any support and efforts you can give would be greatly appreciated and would really get this biking trail known out on the street. Just even telling your friends and families can cause a frenzy and spread the word rapidly. 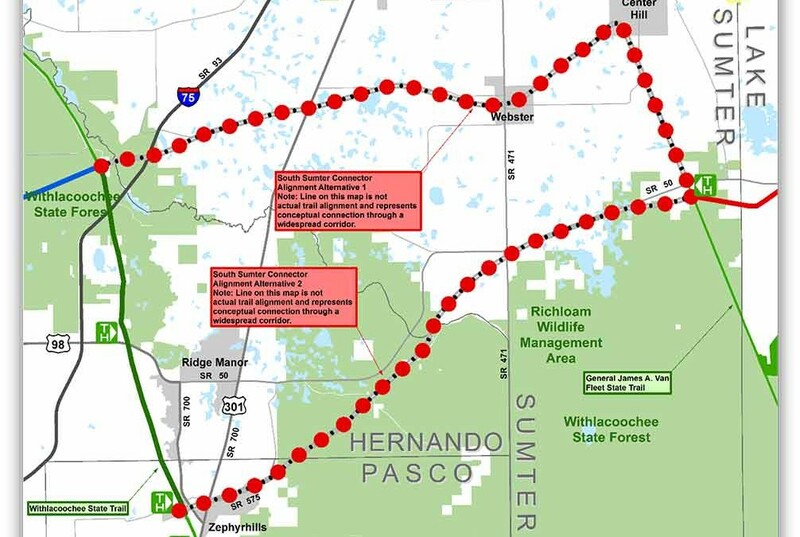 This connection is closing a 20-mile gap connecting Central Florida to almost reaching the Atlantic Ocean. That’s awesome! This could change the biking experience here in Florida drastically. It would really bring in people from all over the world just to ride their bike on this coast to coast trail.